If the transit board does not vote, the system's operating hours could revert to the old hours of 3 a.m. closings Friday and Saturday, midnight closings weeknights, and 7 a.m. to 12 a.m. service Sunday. 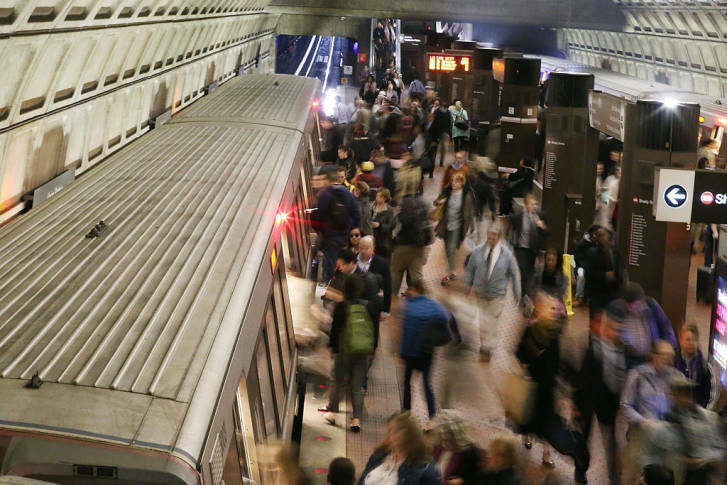 WASHINGTON — The Metro Board is set this week to write-off any return to late-night service or more Sunday hours next year, and to instead push riders toward Uber or Lyft. The board is due to vote Thursday to keep the current hours through at least June 2020. 8 a.m. to 11 p.m. Sunday through at least June 2020. Without the vote, Metrorail could return at the end of June 2019 to the old hours of 3 a.m. closings Friday and Saturday, midnight closings weeknights and 7 a.m. to 12 a.m. service Sunday. The vote would direct General Manager Paul Wiedefeld to “explore and develop mutually beneficial partnerships … for late night hours” with companies like Uber and Lyft. Such programs could include offering would-be Metro riders discounts to use ride-hailing services late at night even as Metro battles the companies at other times of day. Wiedefeld said the reduced hours are crucial to the aging system’s continued maintenance. While it is not clear how much of a direct link there is between the reduced hours and a recent increase in the percentage of riders Metro records as arriving at their destinations within the expected travel time, Metro cites the additional maintenance programs — some of which are done while the system is closed — as a key reason the number of unexpected incidents on the tracks has declined significantly over the last two years. Track cleaning, and cable and stray current testing, is 22 to 37 percent complete, while some track maintenance work is further along than originally expected. Metro still hopes to further reduce the number of smoke or fire incidents on the tracks that delay riders. Declining ridership has at best leveled off, but Metro said remaining riders are now more satisfied with the service. The most survey said 79 percent of rail riders are satisfied with the service. In addition to the more regular maintenance work, Metro has eliminated some of its least reliable railcars, and completed a number of 24/7 work zones to address some of the worst parts of the system. “I definitely understand the importance of getting hours back, and we want to do that, but we can’t do that at the expense of losing reliability for, in effect, the main portion of the system,” Wiedefeld said. “Right now I just cannot recommend that we go that way yet, but clearly I want to get back to improving service and providing more service,” he said. “Things that we can do now, but we don’t want to do that at the expense of future reliability and safety issues,” Wiedefeld said. His focus remains on rush-hour riders. “Right now it’s the late-night service, the weekend service … is it that, or is it the core of the service? And that’s what we’re trying to wrestle with,” Wiedefeld said. The general manager said he sees service improvements for that “core” rush-hour commuter, which Metro is set to keep pushing through an expansion of the “Rush Hour Promise” program. It offers automatic refunds to some rail riders who are significantly delayed during rush hour on lines that have no scheduled track work. The expansion would extend the program for at least six months and reduce the time required to qualify for a refund from at least 15 minutes beyond the longest possible scheduled trip at that time of day to at least 10 minutes beyond that longest possible scheduled trip. Metro has spent half as much on refunds so far as it initially expected, and has provided few refunds to bus riders who must file online forms to get a credit. Through Nov. 13, Metro has issued about $1 million in refunds for approximately 263,000 rush hour trips that were more than 15 minutes late since Jan. 25. Some riders received more than one credit, but Metro said 93 percent of individual riders who got at least one refund have used the system again after the significant delay. The refunds only go to riders who have provided Metro with additional personal information required to register their SmarTrip cards.